Diffusion Pharmaceuticals (NASDAQ:DFFN) expects to begin before the end of 2017 a pivotal clinical trial with its trans sodium crocetinate (TSC) lead compound to re-oxygenate oxygen-deprived tissue in patients with inoperable glioblastoma (GBM) brain cancer prior to conventional radiation and chemotherapy. The Phase 2 study, which enrolled 59 newly diagnosed GBM patients, also demonstrated a clean safety profile and tumor regression, with 11 patients having undetectable tumors. There were no serious adverse events attributed to TSC and no negative effects on quality of life. Results of the study were published in the Journal of Neurosurgery in February 2017. In cancer, he points out that hypoxia, which occurs when the cancer outgrows its blood supply, can lead to aggressive tumor characteristics, such as increased angiogenesis, metastatic potential and resistance to treatment with radiation and chemotherapy. “Our TSC re-oxygenates hypoxic tissue systemically in many disease settings, including cancerous tissue,” he contends. The company has orphan drug designation from the FDA in multiple indications, including GBM. GBM is the deadliest form of brain cancer, with an average life expectancy post-diagnosis of less than two years. In the U.S. alone, approximately 18,000 people are diagnosed with GBM every year. TSC was developed at University of Virginia by Prof John Gainer, Diffusion’s co-founder, under a grant from U.S. Office of Naval Research as an emergency treatment for battlefield casualties suffering life-threatening hypoxia from blood-loss. “We transitioned to oncology as a first focus, based on promising preclinical, and human safety and efficacy data,” Mr. Kalergis points out. When TSC is added to an aqueous solution like blood plasma, he says it causes the aqueous molecules to form more hydrogen bonds with each other. Additional hydrogen bonds change the molecular structure of the aqueous portion of blood plasma. And a more open molecular structure allows oxygen to more easily diffuse into hypoxic tissue. According to Mr. Kalergis, inoperable GBM patients are currently excluded from major clinical trials, highlighting the unmet need and making these patients available for the TSC Phase 3 trial. Based on an end-of-Phase 2 meeting with the FDA, a single Phase 3 study, if successful, could serve as a basis for regulatory approval, he adds. The company expects to enroll 230 newly diagnosed inoperable GBM patients, randomized 1-to-1 into TSC treatment and control groups. Under the protocol, after patients are determined to be inoperable, they would receive TSC dosing immediately prior to an initial six weeks of radiation and chemotherapy. Following a rest period, patients again would receive TSC immediately prior to a 24-week regimen of only chemotherapy. The primary endpoint of the trial is overall survival; secondary endpoints are tumor status, performance and quality of life. Mr. Kalergis figures the Phase 3 trial will take 3 ½ years to complete. Diffusion also has orphan drug designation for TSC as a treatment for metastatic brain cancer, which also is highly hypoxic and causes significant resistance to the current standard of care, which is radiation treatment. In a rat study of metastatic brain cancer, Mr. Kalergis says radiation plus TSC resulted in a 73% survival rate at 60 days, with complete tumor remission in TSC survivors, based on MRI. That compared with 28% survival at 60 days in a radiation-only treatment group, also based on MRI. 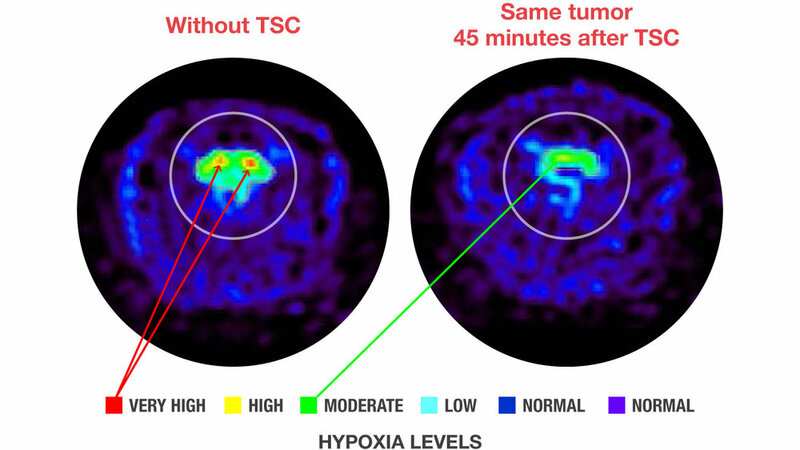 PET scan showing hypoxia levels in rat brain tumor, before and after TSC. In pancreatic cancer, another very hypoxic cancer, he says various animal studies have shown TSC to be a significant enhancer of standard-of-care chemotherapies: gemcitabine and paclitaxel. Having proven safety from the company’s oncology studies would allow the company to begin additional Phase 2 studies for other hypoxia-driven indications beyond oncology, “assuming partnerships or other funding,” he contends. In stroke, for example, hypoxia drives the destruction of neurons in the brain, leading to impairment and death. Mr. Kalergis notes that the company has obtained statistically significantly safety and efficacy results in animal studies with TSC alone and in combination with tPA, a clot buster that is the standard of care in both ischemic and hemorrhagic stoke, respectively. “We’re working with key opinion leaders on a stroke clinical trial design, but here again we’re looking for some sort of partnership,” he adds.